I decided to get slightly dressed up for work recently and took some pictures to prove it! 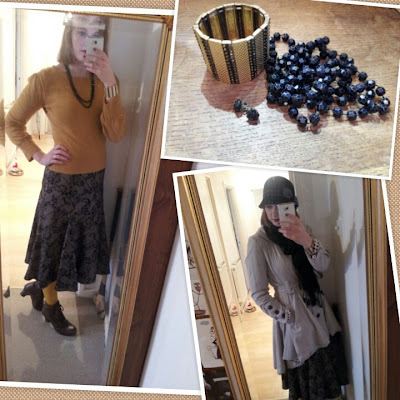 I thought this was quite a nice Autumnal outfit. I’ve gone with a mustard/gold and black theme. The light mustard jumper is from Primark a few years ago, they probably have something similar in at the minute. The skirt is from Very, again a few years ago. I have seen similar skirts in Marks & Spencers. The Mustard tights are either from Newlook or Primark. My boots are from Fly London. The bracelet is from Very, it seems to be currently sold out. The necklace is from Primark, but you can pick similar up elsewhere. The same goes for The flower bud earrings, they are quite common. My hat is from Mad Hatters in Brighton. Love this shop and love my hat. It’s a wool Cloche hat and keeps me nice and warm. Plus it’s a snug fit, so doesn’t blow off on windy days. My trench coat is from Very, I love that it is slightly Victorian feeling. My favourite coat for this time of year. For primer I used Bourjois Matte Serum primer. I used my YSL foundation in BR10 and Maybelline under eye concealer in light. 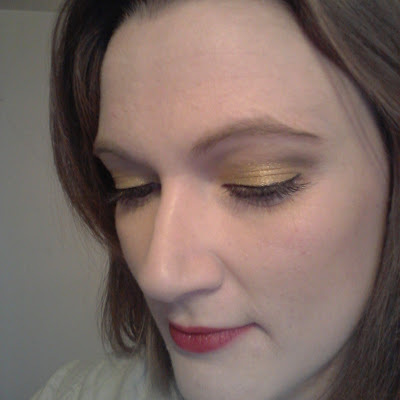 Over the bareMinerals eyelid primer, I applied the gold bareMinerals Ready eyeshadow Louder over the main part of my lid. I blended out my crease lightly with Faint from the Urban Decay Basics palette. I did two coats of L’Oreal Super Liner in Black Diamond thinly along my top lash line, ending with a small flick. For mascara I applied two coats of Le Volume De Chanel. I lightly filled in my eyebrows with the eyebrow kit from elf in Ash. I lightly applied Soap & Glory’s Love At First Blush to the apples of my check sna brushed it back along my cheekbone. 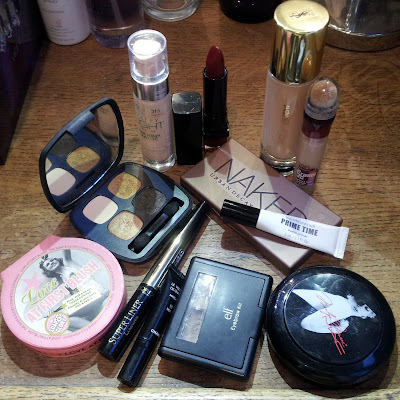 I set the foundation along my T Zone with mac’s Forever Marilyn face powder. I decided I could get away with a slightly bold look, even though I was wearing a slightly dramatic eye. I chose Bourjois 14 Pretty Prune from the Rouge Edition line. I set my face with a few sprits of Urban Decay’s De-Slick setting spray. This is how the look turned out. You can watch a video below if you fancy a closer look at my outfit.